I am coming into this week riding off a horrible toothache and anxiety attack - with a planner full to the brim of things to do and people to see. Right now, I kind of want to curl in a ball with post-anxiety-hangover. I feel a little distant and apathetic, but I know things will get better...and I'm simply reminding myself to breathe. If anything else, just breathe. I was introduced to this daily email series through That's So Retrograde, a podcast I regularly binge on. Anyways, Waking up with Ryan is a free daily email sent to you by life coach Ryan Weiss. The emails contain a 5-minute morning routine - an authentic, inspirational story, a series of inner guidance questions, a request to list 5 things you are grateful for and a thought for the week. While I have the unfortunate habit of grabbing for my phone when I wake up, I like to turn to this email to start my day with some creativity and intention, rather than an aimless Instagram scroll. It's been hot (and grossly humid - a con of living so close to the water) in San Diego. Thank goodness for fans. Sometimes, it's all about the simple things. 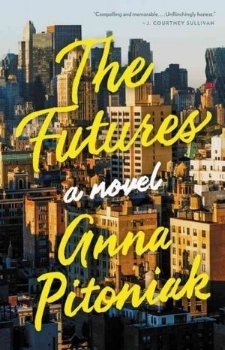 This new book by Anna Pitoniak was incredibly hard to put down. The story was told in alternating chapters from both Julia and Evan - parts of a couple - who moved to NYC after college graduation. Essentially, the book details the end of their relationship, the impact of the economic crisis on their jobs and the confusion that every postgrad experiences. It was...so real and relevant. Post-good-book-hangover happening now. This weekend, Nick and two of our best friends went to Coronado Brewing's 21st Birthday Celebration. We drank, we listened to live music, we took photos, we laughed, we cried. It was truly one of my favorite afternoons. Thanks, Coronado, for hosting a fun party. One of my friends just moved up to Scripps Ranch in San Diego, and I am happy because it gives me the excuse to nom on pizza from Pazzo's. It's truly some of my favorite pizza in San Diego tucked into the most random location in a neighborhood. My go-to order? Pineapple and pepperoni. One of the reasons I love summer is because of stone fruit season. Plums, nectarines, apricots, cherries: get in my belly! But, my all time favorite is peaches. I've been putting peaches everywhere: in my oatmeal, on my pizza, in my salads, on my desserts. Yum! This weekend, someone threw a rager...on my credit card. Shoutout to Chase who caught the fraudulent charges on my card and had the best customer experience I've ever had. Seriously, singing all the praises for them right now. Last week, I found a cute striped blouse for $6, a vibrant maxi dress for $14 and a shift dress for $11. Excuse me - what?! Sometimes, digging through all the red tags is worth it. Thanks, Target from those of us balling on a budget. I found this song on a State of Trance...and it is everything to me lately.